Have your special event overlooking the Enterprise Center Event floor. The social atmosphere of this space resembles that of your favorite sports bar. With three different catering options, starting at $90 a person your group with have an event to remember. Minimum capacity of 100. 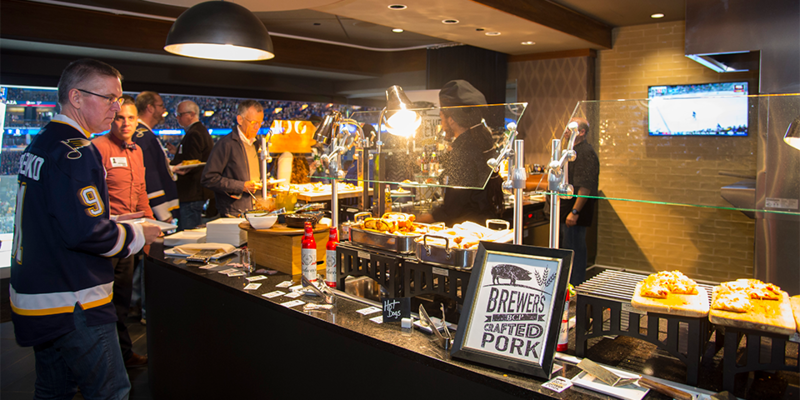 An exclusive new space on the Club Level at Enterprise Center, the Jameson Club, will give your guests an intimate party overlooking 14th and Clark. Catering packages begin at $90 per person. Minimum Capacity of 100. One of the premier spaces in Enterprise Center, the Scott Credit Union Rinkside Club will make you feel like you and your guests are VIPs. This new space on event level has a private entrance for your guests, modern amenities and a great space for socializing. Catering packages begin at $90 per person. Minimum Capacity of 200.